However, the current NASCAR Cup Series feature 39 weeks of race from February to November. That doesn’t leave much room for new tracks. Most tracks on the schedule have their dates locked in via 5-10 year contracts. Those track contracts have locked the schedule into it’s current stale form until 2020. In the same interview, NASCAR executive Steve O’Donnell stated that he understand the short track desire. He also stated talks were already underway to bring new short tracks and road courses to the schedule. They’re locked in to 2020. Yet, to combat that problem, there’s an idea floating around out there about mid-week races. Maybe the weekends are full, but the weeks aren’t. If NASCAR wanted to, they could probably host two races per week. The idea first surfaced from Denny Hamlin. He stated that he was a member of a secret drivers’ council. That’s aside from the other council put into place by NASCAR which Hamlin formerly held a seat at. Hamlin stated that he saw mid-week races as a real possibility in the near future. Lucas Oil Raceway is formerly known as IRP (Indianapolis Raceway Park). The 0.686-mile track rests just 10 miles from downtown Indianapolis, Indiana. It’s a flat short track with wide corners. Previously, both the NASCAR Xfinity Series and the NASCAR Camping World Truck Series ran at the short track when it was known as IRP. The NXS and NCWTS both made their final stop at the track in 2011. 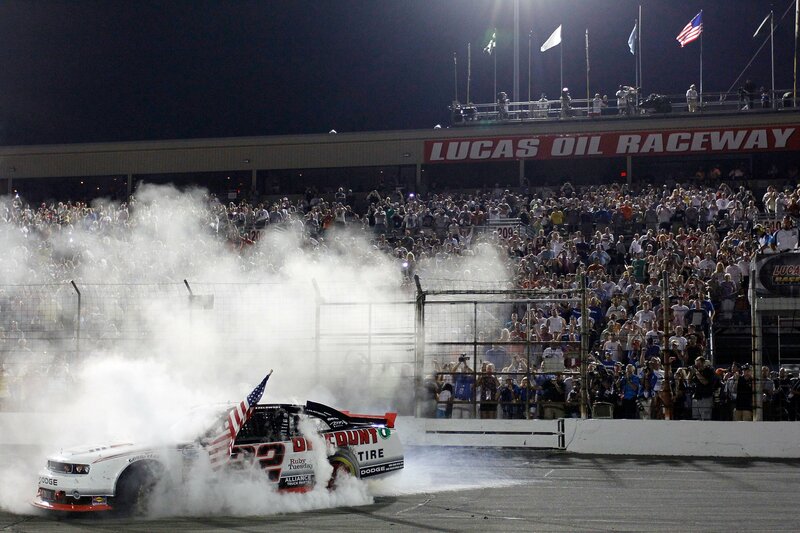 Brad Keselowski was the last Xfinity Series winner at the track that was then known as Indianapolis Raceway Park in 2011. He topped James Buescher to take the win. Lucas Oil Raceway currently hosts a select few events each season. The 2018 schedule included: ARCA Racing Series, USAC Hall of Fame Classic, CRA Fall Brawl and two other shows. Meanwhile, at Indianapolis Motor Speedway, they’re trying some things. The race was moved to the regular season championship race. It didn’t work out so well this weekend as rain pelted every session including both races which were re-scheduled for Monday afternoon. Beyond the schedule, the aero ducts that were introduced in the NASCAR All-Star Race came from an idea that spawned at IMS in 2017. The NASCAR Xfinity Series made the debut with the package at Indy in 2017. It brought much closer racing and heavy drafting to the event that typically sees few lead changes. The Xfinity Series ran that package again on Saturday. It’s rumored that package could be seen at 13 tracks in 2018 for the Monster Energy NASCAR Cup Series. 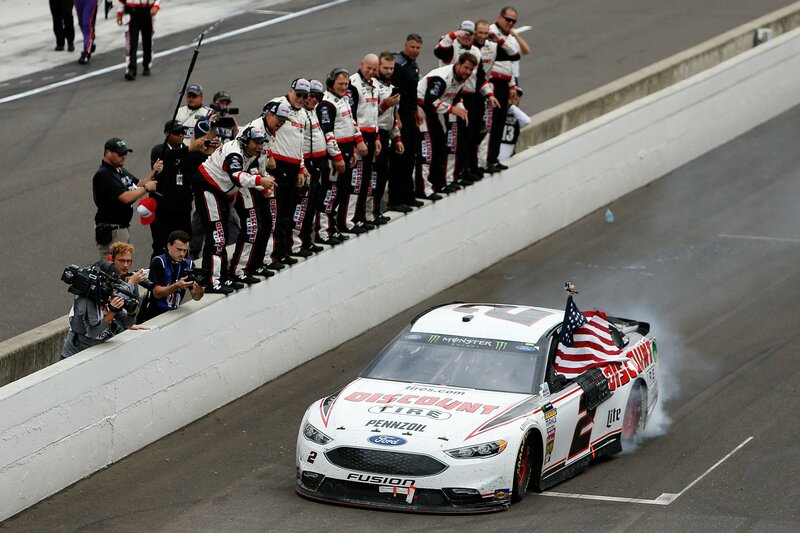 Keselowski picked up the win at Indianapolis Motor Speedway on Sunday.